Boys rally late against Red Raiders; Gabby Carr qualifies for sectionals in 200 medley. The Vineyarders swam in back-to-back dual meets, in Barnstable against the Red Raiders on Friday and home to the Nauset Warriors on Saturday. The girls suffered their first defeats of the season, 111-54 to the Red Raiders and 92-70 to Nauset, while the boys rallied to beat Barnstable, 78-73, and lost to the Warriors, 93-64. Both teams are 4-2 on the season. 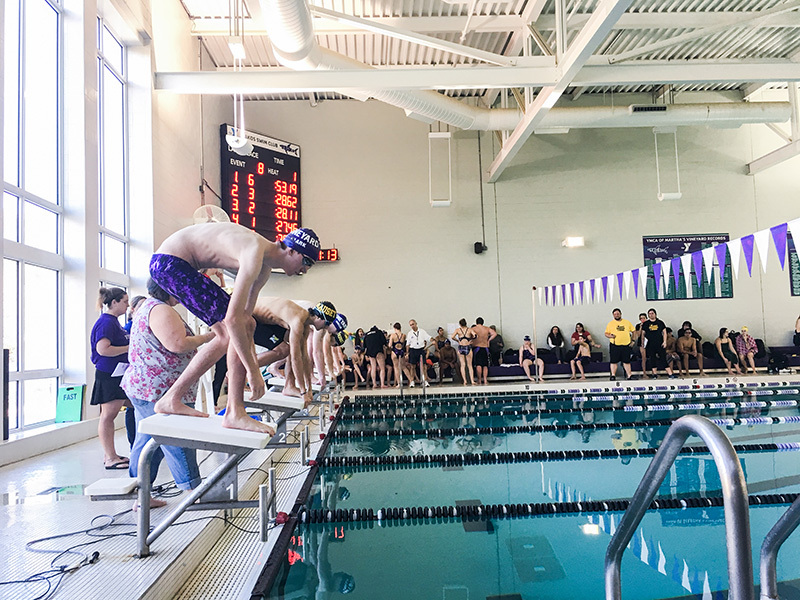 Friday, the boys trailed Barnstable by one point going into the last event, needing to win the 400 freestyle relay to win the meet, and they did just that. Oliver Dorr, Greg Clark, Christian Flanders, and Ruairi Mullin took first place in 4:10.28, with Nicholas Lytle, Ryan Laslovich, Everett Dorr, and Jack Crawford finishing third. Earlier in the meet, Oliver Dorr, Clark, Flanders, and Mullin also swam to victory in the 200 free relay. Mullin won two individual events for the boys, the 100 free (58.07) and 200 free (personal best 2:07.62), and Oliver Dorr swam a personal best 2:22.25 to win the 200 individual medley and added another PB with a second place in the 100 fly. Gabby Carr won two events for the girls, taking the 200 individual medley in a sectional-qualifying time of 2:26.84, and the 500 free in 5:48.89. The girls also won the 200 medley relay with Carr, Yayla DeChiara, Delilah Hammarlund, and Eleanor Hyland clocking in at 2:12.83. Saturday at the Y, Gabby Carr was a double winner, placing first in the 200 free (2:10.59) and 100 fly (1:06.94). Yayla DeChiara took first in the 100 back (1:09.13) and added a second in the 50 free, while seventh grader Olympia Hall won the 500 free by swimming her best time of 6:36.79. The girls had one winning relay, the 400 free, with Carr, Jasselle Wildanger, eighth grader Annabelle Brothers, and DeChiara finishing first in 4:15.62. The boys failed to win an individual event against the Warriors, but recorded a trio of personal best times. Oliver Dorr had a pair of PBs, swimming second in both the 100 back and 200 free. Ruairi Mullin earned a personal best with a second-place finish in the 100 free, and added another second in the 50 free. The boys grabbed their only win over Nauset in the 400 free relay, with Mullin, Nicholas Lytle, Christian Flanders, and Oliver Dorr placing first in 4:15.20. Previous articleRichard J. Andrade Sr.